Every Friday and Saturday night at One Market restaurant in San Francisco, a different animal stars in a very special menu. At the restaurant, near the Hyatt Regency San Francisco, the “Weekly Beast” dinner is a $49 five-course prix fixe that showcases the versatility and deliciousness of a particular farm-raised animal from head to hoof or foot. It’s a chance to understand exactly how different parts of one animal — be it Duroc pig or Muscovy duck — can have such different flavors and textures. 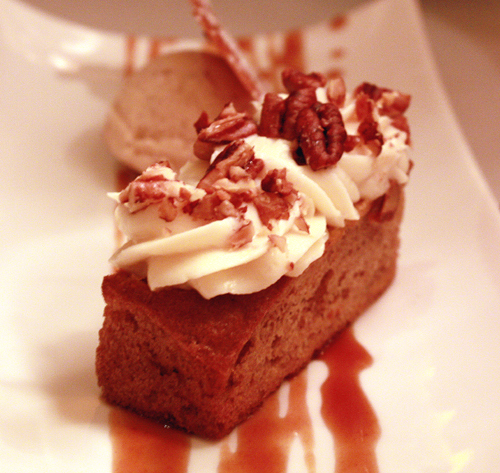 For those who aren’t quite ready to make that much of a commitment, the dishes also are available à la carte. Recently, Chef Mark Dommen invited me in as his guest to try his “Weekly Beast” dinner featuring goat from Marin Sun Farms in Point Reyes Station. Since I”ve only had goat once or twice before — and always just one dish of it at a time — I was eager to experience the nuances evident in various preparations of the animal all at once. 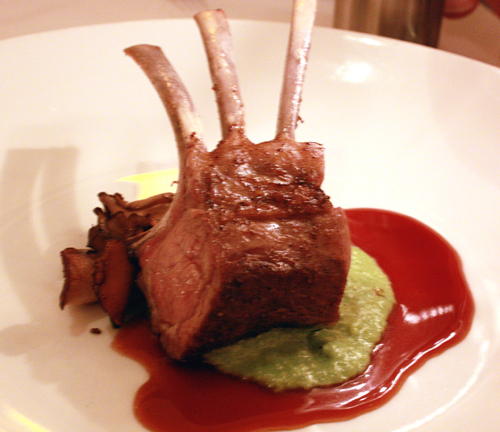 “Goat is to lamb what veal is to cow,” Dommen says, meaning that it’s almost lamb-lite in terms of flavor and texture. 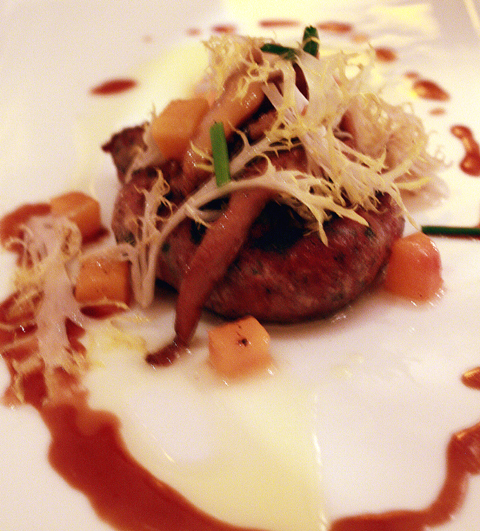 Before the first goat dish arrived, Dommen sent out a few amuses and extra tastes my way. 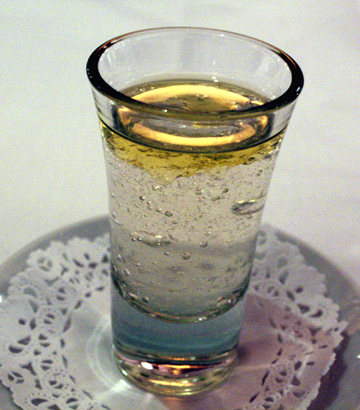 A shot glass of apple water was like a soft, barely set Jell-O shot. It got even more body with a float of lemon oil was at once refreshing yet ever so decadent. 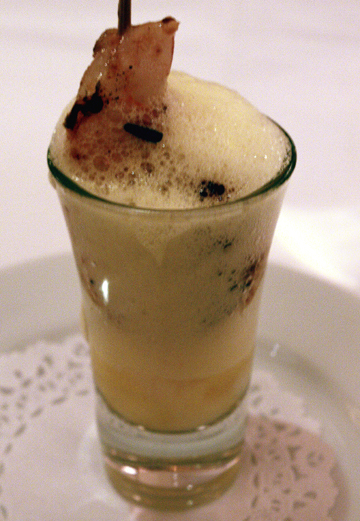 Another tiny amuse followed, this one a single grilled shrimp with great charred flavor that was dunked inside a citrusy tequila-lime float. 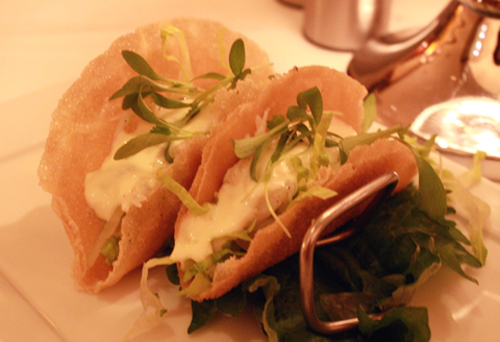 Finally, two mini Dungeness crab tacos that were bright and crunchy. I wrapped the two-bite treats in my favorite shiso leaves for an extra minty hit. Now, it was time to get the goat party started. The first dish was composed of rounds of seared, meaty sausage made of ground goat. Tender and nicely seasoned, they were garnished with a tangle of apricot-y chanterelle mushrooms and cubes of soft-sweet butternut squash. 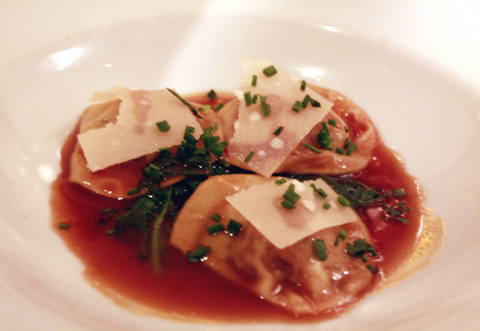 Next, little pillows of goat agnolotti were encased in very thin, extremely tender pasta sheets, then topped with shards of Parmigiano in an intense goat jus sauce. This pasta filling had a ropey texture that made it far more interesting than the usual compacted ground-meat variety. The braised goat ragout was surprisingly as robust as beef stew. Baby turnips added a touch of sweetness to the dish. Rack of goat is first cooked sous vide, then seared. The meat was tender with an unusual texture — almost slick with the sensation of tiny fat globules bursting as you chewed. The finale was an incredibly airy, fluffy carrot cake that had the lovely tang of goat’s milk yogurt in the thick, creamy frosting. 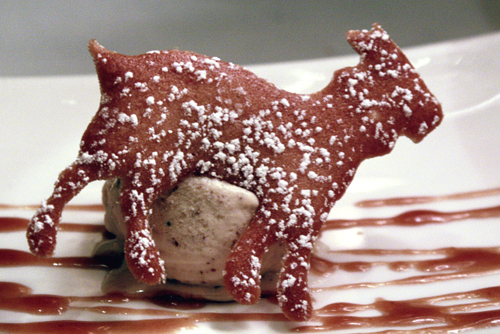 For a cute touch, a cookie shaped like a goat adorned an accompanying scoop of butter pecan ice cream. The goat dishes were all good-sized, making the $49 prix fixe with only an additional $20 for wine pairings for each course, quite a deal. At the end of the meal, I came away with a much greater appreciation for goat. My only minor quibble would be that the deep, dark goat jus used to sauce many of the dishes began to taste a little repetitious after awhile. 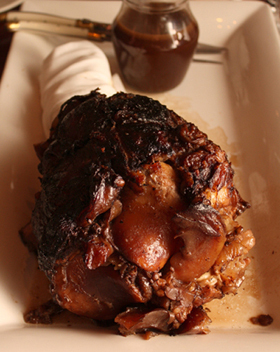 Dommen says the “Weekly Beast” dinners have proven a hit with diners. Each night they’re available, as many as 40 customers opt for it. Try one for yourself. 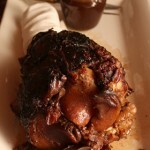 Feb. 5-6, the “Weekly Beast” will showcase hog from Devil’s Gulch Ranch; Feb. 12-13, it’s lamb from Devil’s Gulch Ranch. I love the idea of this! I’d love to do something similar for a dinner party. Such a clever and intelligent idea. Oh man ….. I was drooling every step of the way… I love goat meat. thank you for sharing! So glad to hear about this. 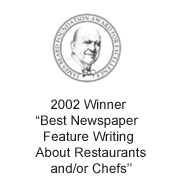 I’ve been reading these menus in the Chronicle for a while now, wishing to go. I’d love to try the lamb and duck menus. And those portions are huge for a tasting menu. Sounds like a great deal indeed. 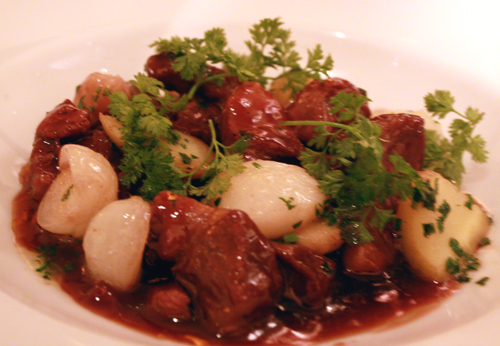 We had goat last night but not nearly as refined servings – need to try it if only for comparison purposes. $49 for five courses is a really good deal! OK, I want the night on duck! Sounds great. Or, at least, not b-a-a-a-d. I am feeling a little more than envious of this meal. If I had your way can you take me to dinner? I’ll feel much better then. *head your way* not had. I must be still in awe. Wow. That agnolitti and the braised goat ragout looks fantastic. I’m pretty sure I’ll be making a trip to SF again. Will you be attending the Foodbuzz Fest? What a feast for such a reasonable price! I love the cute goat cookie! I’ll have to check it out sometime since I work right around the corner. One Market is one of my go to restaurants in the city. I even had a surprise birthday dinner here in November. This sounds affordable and I haven’t had goat before either. Goat tacos are all the rage now too. 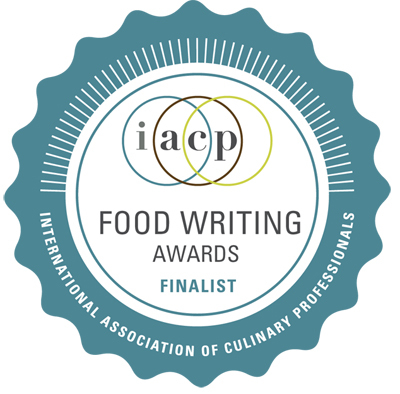 Looks delicious, and who doesn’t love to learn a bit about the food they’re eating? Interesting how everyone loves the cute goat cookie, but they don’t mind eating the cute goat of which they conveniently are shielded from witnessing the slaughter. What animals are forced to go through for humans to put flesh on the plate so you can put flesh in your mouths is atrocious. This is such a barbaric practice, and people are so disconnected from the reality. Watch some of the numerous videos of the blood, screams, abuse, sometimes hanging, molestation, beating, stabbing, that goes into the dairy, egg, and meat industry and maybe that cookie won’t be so cute. Put the pieces together people, stop being disconnected from reality. And if you don’t mind the reality, well… that’s just a shame. And don’t get pissy for me bringing light to the reality. Some did say they like learning about the food they eat. Just sayin’…. Media and corporations pick and choose what you know, but the reality is hidden, until someone goes undercover in this awful places. Hey, “Interesting”! 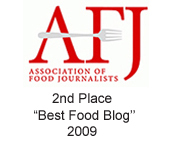 Given this site has long been recognized for superior, prize-winning food writing and is enjoyed by countless readers, your uninvited rudeness to burst in like an on-line suicide-bomber exploding your graphic opposition that clearly belongs elsewhere is as repulsive as your examples for editorializing —so, oh self-styled “Interesting”—here, you’re decidedly NOT. And trying to intimidate our sweet Food Gal with the pre-emptive warning “don’t get pissy with me…”, allow me to reply in the same vein: PISS OFF! And when you do, “Interesting”, stay in the same December of 2010 time frame you set your computer at. Wotta twit!